During the Naranja de Sevilla orange festival about 30 restaurants offered a variety of tapas made by using the famous orange as an ingredient (read about the event here). I was determined to go on a tapas crawl and try all the 30 dishes but had to make do with only a few. 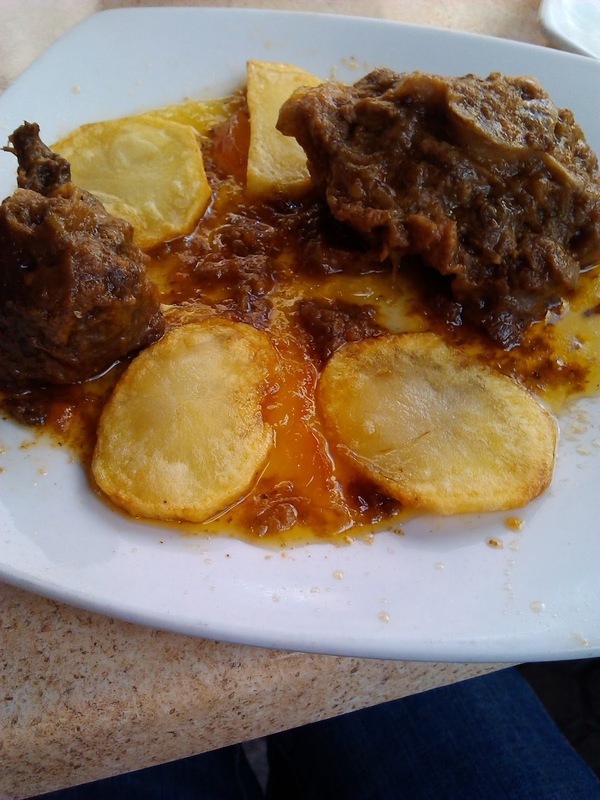 I tried to choose restaurants that offered something special that we hadn’t tried before and the first meal on my list was a very typical Andalucian dish: oxtail stew or ‘rabo de toro’. This dish originates from Córdoba and we have been seeing it offered as a full portion many times however we never tried it just in case we didn’t like it. We needn’t have worried. Finally the time has come when we could order it as a tapa and we were pleased to see the amount of meat piled on our plate. The ‘rabo de toro’ is a hearty stew that is very tasty and at the same time very filling. A plate was enough for us for lunch. I am definitely a fan of this dish. The second choice fell on another famous dish called ‘cochinillo’. 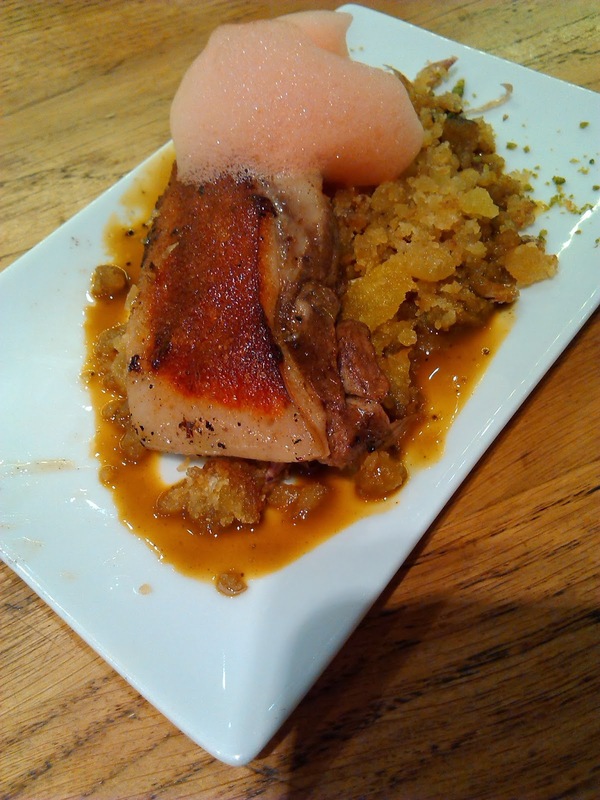 This is a famous dish from Segovia in Castilla y León where the serving has an interesting ritual attached to it. The meat of the suckling pig has to be so soft that the edge of a plate should be enough to cut it. This is demonstrated in the above mentioned town by the waiters who, after cutting the meat, will smash the plate on the floor. Unfortunately the plate-smashing did not happen in this restaurant however the meat was delicious. The dish has made it to my favourites. As we haven’t been to the other side of the river much we decided that we’ll find a restaurant there, in Triana. The choice was good as the tapa was very original. We were served cod as tempura with an interesting sauce. It combined the sweetness of the orange with the pepperiness of the red pepper. It was definitely our favourite dish during the fiesta. After trying beef, pork and fish I wanted something different. The choice fell on a restaurant right in front of the Cathedral of Seville. On the day we went there to sample their tapa (in the disguise of a language exchange with a friend) the sun was shining and it was nice and warm for the first time this year. The meat was duck and the dish was very interesting. As much as we could see it was a spring roll on top of a piece of bread. The orange was represented in that little cube of jelly on the side (FAIL on originality) but they used edible flower petals as decoration (PASS on representation). The whole thing was sweet and more like a dessert than an actual meal. Our last ‘tapa a la naranja’ was consumed on a lovely square called Doña Elvira which is full of tiled benches and shaded by orange trees. This tapa was made up of ox tongue in pastry with sweet orange sauce. It was the best finale for our gastronomy experience.